It’s been several months since I’ve come across any news on invisibility cloak technology, something of a pet subject around here, but here’s the very latest — findings on transformation optics. WEST LAFAYETTE, Ind. — Researchers have overcome a fundamental obstacle in using new “metamaterials” for radical advances in optical technologies, including ultra-powerful microscopes and computers and a possible invisibility cloak. 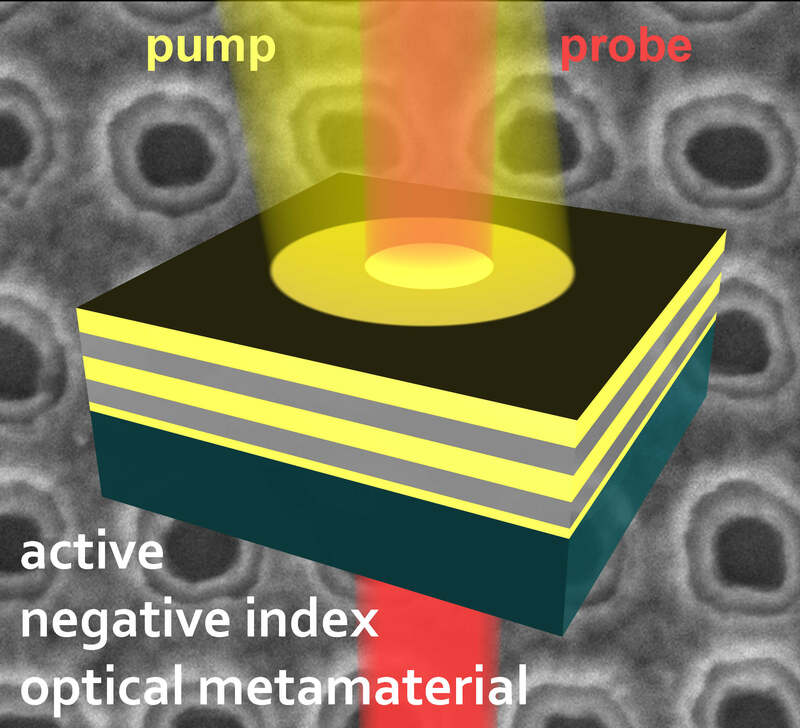 The metamaterials have been plagued by a major limitation: too much light is “lost,” or absorbed by metals such as silver and gold contained in the metamaterials, making them impractical for optical devices. However, a Purdue University team has solved this hurdle, culminating three years of research based at the Birck Nanotechnology Center at the university’s Discovery Park. Research findings are detailed in a paper appearing on Aug. 5 in the journal Nature. The material developed by Purdue researchers is made of a fishnet-like film containing holes about 100 nanometers in diameter and repeating layers of silver and aluminum oxide. The researchers etched away a portion of the aluminum oxide between silver layers and replaced it with a “gain medium” formed by a colored dye that can amplify light. Other researchers have applied various gain media to the top of the fishnet film, but that approach does not produce sufficient amplification to overcome losses, Shalaev said. Instead, the Purdue team found a way to place the dye between the two fishnet layers of silver, where the “local field” of light is far stronger than on the surface of the film, causing the gain medium to work 50 times more efficiently. The approach was first developed by former Purdue doctoral student Hsiao-Kuan Yuan, now at Intel Corp., and it was further developed and applied by doctoral student Shumin Xiao. Unlike natural materials, metamaterials are able to reduce the “index of refraction” to less than one or less than zero. Refraction occurs as electromagnetic waves, including light, bend when passing from one material into another. It causes the bent-stick-in-water effect, which occurs when a stick placed in a glass of water appears bent when viewed from the outside. Being able to create materials with an index of refraction that’s negative or between one and zero promises a range of potential breakthroughs in a new field called transformation optics. 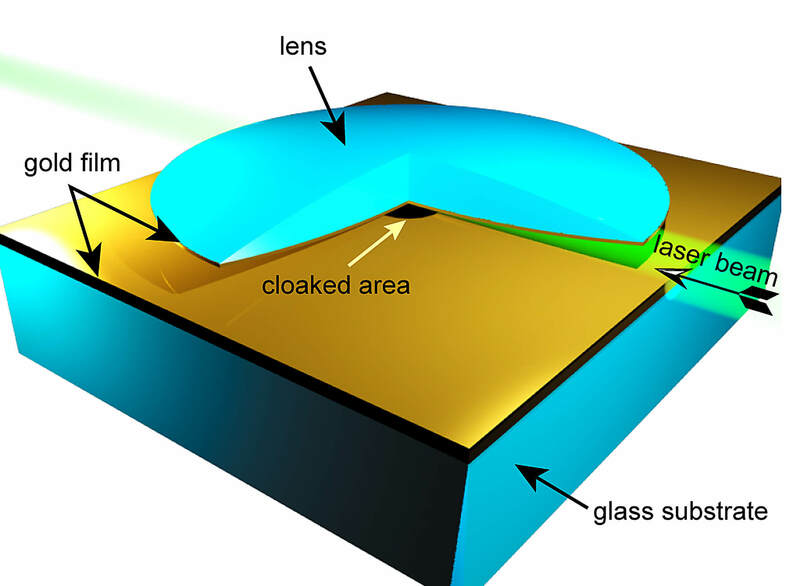 Possible applications include a “planar hyperlens” that could make optical microscopes 10 times more powerful and able to see objects as small as DNA; advanced sensors; new types of “light concentrators” for more efficient solar collectors; computers and consumer electronics that use light instead of electronic signals to process information; and a cloak of invisibility. Excitement about metamaterials has been tempered by the fact that too much light is absorbed by the materials. However, the new approach can dramatically reduce the “absorption coefficient,” or how much light and energy is lost, and might amplify the incident light so that the metamaterial becomes “active,” Shalaev said. The Nature paper was written by Xiao, senior research scientist Vladimir P. Drachev, principal research scientist Alexander V. Kildishev, doctoral student Xingjie Ni, postdoctoral fellow Uday K. Chettiar, Yuan, and Shalaev. Fabricating the material was a major challenge, Shalaev said. First, the researchers had to learn how to precisely remove as much as possible of the aluminum oxide layer in order to vacate space for dye without causing a collapse of the structure. “You remove it almost completely but leave a little bit to act as pillars to support the structure, and then you spin coat the dye-doped polymer inside the structure,” he said. The researchers also had to devise a way to deposit just the right amount of dye mixed with an epoxy between the silver layers of the perforated film. “You can’t deposit too much dye and epoxy, which have a positive refractive index, but only a thin layer about 50 nanometers thick, or you lose the negative refraction,” Shalaev said. Future work may involve creating a technology that uses an electrical source instead of a light source, like semiconductor lasers now in use, which would make them more practical for computer and electronics applications. The work was funded by the U.S. Army Research Office and the National Science Foundation. Here’s news on a new artificial optical material with applications for invisibility cloaking tech and more. IMAGE: Arrays of coupled plasmonic coaxial waveguides offer a new approach by which to realize negative-index metamaterials that are remarkably insensitive to angle of incidence and polarization in the visible range…. PASADENA, Calif.—A group of scientists led by researchers from the California Institute of Technology (Caltech) has engineered a type of artificial optical material—a metamaterial—with a particular three-dimensional structure such that light exhibits a negative index of refraction upon entering the material. In other words, this material bends light in the “wrong” direction from what normally would be expected, irrespective of the angle of the approaching light. This new type of negative-index metamaterial (NIM), described in an advance online publication in the journal Nature Materials, is simpler than previous NIMs—requiring only a single functional layer—and yet more versatile, in that it can handle light with any polarization over a broad range of incident angles. And it can do all of this in the blue part of the visible spectrum, making it “the first negative index metamaterial to operate at visible frequencies,” says graduate student Stanley Burgos, a researcher at the Light-Material Interactions in Energy Conversion Energy Frontier Research Center at Caltech and the paper’s first author. “This work stands out because, through careful engineering, greater simplicity has been achieved,” says Ares Rosakis, chair of the Division of Engineering and Applied Science at Caltech and Theodore von Kármán Professor of Aeronautics and Mechanical Engineering. In addition to Burgos and Atwater, the other authors on the Nature Materials paper, “A single-layer wide-angle negative index metamaterial at visible frequencies,” are Rene de Waele and Albert Polman from the Foundation for Fundamental Research on Matter Institute for Atomic and Molecular Physics in Amsterdam. Their work was supported by the Energy Frontier Research Centers program of the Office of Science of the Department of Energy, the National Science Foundation, the Nederlandse Organisatie voor Wetenschappelijk Onderzoek, and “NanoNed,” a nanotechnology program funded by the Dutch Ministry of Economic Affairs. To date all the invisibility cloak tech blogging I’ve done has covered the rapid development of this branch of science. Here’s some virtual ink on the other side of the cloaking coin. Since then, Baile Zhang and buddies at the Massachusetts Institute of Technology in Cambridge, have been busy looking for the weak point in this idea and now think they’ve found it. Today, they point out that carpet cloaks have a flaw that makes the objects within them detectable. The problem, they say, is that isotropic cloaks cannot work perfectly. Here’s why. Light can be thought of as a series of wavefronts each with a certain amount of energy. Ordinarily, the direction of energy propagation is at right angles to these wavefronts. However, in an invisibility cloak, this perpendicular relationship becomes distorted as the light waves are steered. That’s what an anisotropic material does. But an isotropic material cannot do this–the energy always propagates at right angles to the wavefronts. This limitation means that isotropic materials cannot hide objects in the way Pendry suggests. Zhang and co go on to prove their assertion by tracing a ray that passes through the kind of isotropic carpet cloak that Pendry suggested. What they’ve discovered will shock carpet cloakers all over the world. According to Zhang and buddies, carpet cloaks don’t hide objects, they merely shift them to one side by an amount that is just a bit less than they are high. Crucially the effect depends on the angle at which you are looking. So when illuminated at an angle of 45 degrees, an object 0.2 units tall appears laterally shifted by 0.15 units. If Zhang and co are correct, this could be a substantial blow for isotropic carpet cloaking. It means that the carpet cloaking effect has a limited angle of view. An interesting spin on the burgeoning invisibility cloak tech. In a twist on the concept of an invisibility cloak, researchers have designed a material that not only makes an object invisible, but also generates one or more virtual images in its place. Because it doesn’t simply display the background environment to a viewer, this kind of optical device could have applications that go beyond a normal invisibility cloak. Plus, unlike previously proposed illusion devices, the design proposed here could be realized with artificial metamaterials. The team of engineers, Wei Xiang Jiang, Hui Feng Ma, Qiang Cheng, and Tie Jun Cui from Southeast University in Nanjing, China, describes the recently developed class of optical transformation media as “illusion media.” As they explain in a new study, any object enclosed by such an illusion medium layer appears to be one or more other objects. The researchers’ proposed device is designed to operate at microwave frequencies. Illusion media can transform a real image into a virtual image. 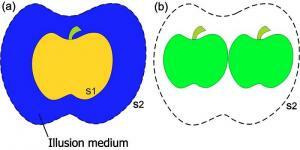 For example, a golden apple (the actual object) enclosed within the illusion medium layer appears as two green apples (the illusion) to any viewer outside the virtual boundary (dashed curves). Image credit: Jiang, et al. It’s been a while since I’ve had the opportunity to blog about invisibility cloak tech (seven months on the dot, to be exact), but here’s the latest from Germany’s Karlsruhe Institute of Technology. Researchers at Germany’s Karlsruhe Institute of Technology report they were able to cloak a tiny bump in a layer of gold, preventing its detection at nearly visible infrared frequencies. Their cloaking device also worked in three dimensions, while previously developed cloaks worked in two dimensions, lead researcher Tolga Ergin said. The cloak is a structure of crystals with air spaces in between, sort of like a woodpile, that bends light, hiding the bump in the gold later beneath, the researchers reported in Thursday’s online edition of the journal Science. In this case, the bump was tiny, a mere 0.00004 inch high and 0.0005 inch across (100 microns x 30 microns), so that a magnifying lens was needed to see it. “Other fabrication techniques, though, might lead to larger cloaks,” he added in an interview via e-mail. Via KurzweilAI.net — Here’s the latest news on invisibility cloaktechnology, a longtime favorite subject for this blog. A lot of this stuff is really getting deeper and deeper into the world of science fiction as science fact. Of course, I’m still waiting to see a convincing real-world demonstration of the basic cloaking technology touted the last few years, so maybe all this news remains in the world of fiction. Either way, it’s a fun topic. A “hidden portal” invisibility cloak may be possible using exotic new single-crystal yttrium-iron-garnet ferrite metamaterials that force light and other forms of electromagnetic radiation in complicated directions, researchers from the Hong Kong University of Science and Technologyand Fudan University have found. People standing outside the portal would see something like a mirror. Via KurzweilAI.net — I’ve done plenty of blogging on invisibility cloaking technology, and here’s the lastest. I think this tech is very cool and I hate to throw any cold water on the latest news, but I’d be more impressed with seeing an actual effective working model of a simple cloaking device before getting to wild with advanced varients like those described below. An illusion device using metamaterials that makes one object look like another could one day be used to camouflage military planes or create “holes” in solid walls. To make a cup look like a spoon, for example, light first strikes the cup and is distorted. It then passes through a complementary metamaterial which cancels out the distortions to make the cup seem invisible. The light then moves into a region of the metamaterial that creates a distortion as if a spoon were present. The result is that an observer looking at the cup through the metamaterial would see a spoon. Yep, news on invisibility cloaks returns once again. This time with a twist — metamaterials that can go beyond a simple cloak of invisibility and actually create the illusion of a totally different object in place of the one being cloaked. Metamaterials could be used for an even more exotic effect than invisibility cloaks: to create the illusion that a different objectis present, Hong Kong University of Science and Technology researchers say. I’ve done plenty of blogging on cloak of invisibility tech, and here’s the latest news from PhysOrg. A paper published in the March 2009 issue of SIAM Review, “Cloaking Devices, Electromagnetic Wormholes, and Transformation Optics,” presents an overview of the theoretical developments in cloaking from a mathematical perspective. One method involves light waves bending around a region or object and emerging on the other side as if the waves had passed through empty space, creating an “invisible” region which is cloaked. For this to happen, however, the object or region has to be concealed using a cloaking device, which must be undetectable to electromagnetic waves. Manmade devices called metamaterials use structures having cellular architectures designed to create combinations of material parameters not available in nature. Mathematics is essential in designing the parameters needed to create metamaterials and to show that the material ensures invisibility. The mathematics comes primarily from the field of partial differential equations, in particular from the study of equations for electromagnetic waves described by the Scottish mathematician and physicist James Maxwell in the 1860s. One of the “wrinkles” in the mathematical model of cloaking is that the transformations that define the required material parameters have singularities, that is, points at which the transformations fail to exist or fail to have properties such as smoothness or boundness that are required to demonstrate cloaking. However, the singularities are removable; that is, the transformations can be redefined over the singularities to obtain the desired results. From KurzweilAI.net — I’ve blogged on invisibility cloaks and their feasibility here and here. Now all that excitement may be undone. ScienceDaily, Sep. 3, 2008Chinese scientists have proposed a theoretical “anti-cloak” that would partially cancel the effect of an invisibility cloak. PhysOrg covered this as well with a some detail on what the anti-cloak is actually about and how it could be implemented. An even greater problem for anyone who has aspirations to be concealed in public one day is that invisibility achieved through transformation media is a two-way street. With no light penetrating a perfect invisibility cloak, there would be no way for an invisible person to see outside. In other words, invisible people would also be blind—not exactly what Harry Potter had in mind. But now, Chen and his colleagues have developed way to partially cancel the invisibility cloak’s cloaking effect. Their “anti-cloak” would be a material with optical properties perfectly matched to those of an invisibility cloak. (In technical jargon, an anti-cloak would be anisotropic negative refractive index material that is impedance matched to the positive refractive index of the invisibility cloak). This isn’t really on my typical topic of invisibility cloaks, but it is a very interesting cloaking technology. SALT LAKE CITY, Aug. 17, 2009 – University of Utah mathematicians developed a new cloaking method, and it’s unlikely to lead to invisibility cloaks like those used by Harry Potter or Romulan spaceships in “Star Trek.” Instead, the new method someday might shield submarines from sonar, planes from radar, buildings from earthquakes, and oil rigs and coastal structures from tsunamis. Milton conducted the studies with Fernando Guevara Vasquez and Daniel Onofrei, both of whom are assistant professors-lecturers in mathematics. The research was funded by the National Science Foundation and the University of Utah. Cloaking involves making an object partly or completely invisible to incoming waves – sound waves, sea waves, and seismic waves, but usually electromagnetic waves such as visible light, microwaves, infrared light, radio and TV waves. In recent years, scientists devised and tested various cloaking schemes. They acknowledge practical optical cloaking for invisibility is many years away. Experiments so far have been limited to certain wavelengths such as microwaves and infrared light, and every method tried so far has limitations. Most previous research used interior cloaking, where the cloaking device envelops the cloaked object. Milton says the new method “is the first active, exterior cloaking” technique: cloaking devices emit signals and sit outside the cloaked object. The Physical Review Letters study demonstrates the new cloaking method at a single frequency of electromagnetic waves, while the Optics Express paper demonstrates how it can work broadband, or at a wide range of frequencies. In one video, with the kite-shaped object uncloaked, the wave clearly interacts with the object, creating expanding, circular ripples like when a rock is thrown in a pond. In the second video, the object is surrounded by three point-like cloaking devices, each of which emits waves that only propagate a short distance. Those points and their emissions resemble purple sea urchins. As the passing waves roll by the cloaking devices, waves emitted by those devices interfere with the passing waves. As a result, the passing waves do not hit the cloaked object and there are no ripples. Milton says the cloaking devices cause “destructive interference,” which occurs when two pebbles are thrown in a pond. In places where wave crests meet, the waves add up and the crests are taller. Where troughs meet, the troughs are deeper. But where crests cross troughs, the water is still because they cancel each other out. The principle, applied to sound waves, is “sort of like noise cancelation devices you get with headphones in airplanes if you travel first class,” Milton says. “Our method may have application to water waves, sound and microwaves [radar],” including shielding submarines and planes from sonar and radar, respectively, and protecting structures from seismic waves during earthquakes and water waves during tsunamis, Milton says. All those waves have wavelengths much larger than those of visible light, so the possible applications should be easier to develop. The new method’s main disadvantage “is that it appears you must know in advance everything about the incoming wave,” including when the pulse begins, and the frequencies and amplitudes of the waves within the pulse, Milton says. That might require placement of numerous sensors to detect incoming seismic waves or tsunamis. A video showing an object uncloaked and cloaked as a wave passes may be seen and downloaded from http://vimeo.com/6092319 or as separate videos from http://vimeo.com/5406253 (no cloaking) and http://vimeo.com/5406236 (with cloaking). This is heading into science fiction territory, but it is very cool. Intruder Alert: TAU’s “Smart Dew” Will Find You! A remarkable new invention from Tel Aviv University — a network of tiny sensors as small as dewdrops called “Smart Dew” — will foil even the most determined intruder. Scattered outdoors on rocks, fence posts and doorways, or indoors on the floor of a bank, the dewdrops are a completely new and cost-effective system for safeguarding and securing wide swathes of property. Prof. Yoram Shapira and his Tel Aviv University Faculty of Engineering team drew upon the space-age science of motes to develop the new security tool. Dozens, hundreds and even thousands of these Smart Dew sensors — each equipped with a controller and RF transmitter/receiver — can also be wirelessly networked to detect the difference between man, animal, car and truck. “We’ve created a generic system that has no scale limitations,” says Prof. Shapira. This makes it especially useful for large farms or even the borders of nations where it’s difficult, and sometimes impractical, to install fences or constantly patrol them. Each individual “dew droplet” can detect an intrusion within a parameter of 50 meters (about 165 feet). And at a cost of 25 cents per “droplet,” Prof. Shapira says that his solution is the cheapest and the smartest on the market. Unlike conventional alarm systems, each droplet of Smart Dew can be programmed to monitor a different condition. Sounds could be picked up by a miniature microphone. The metal used in the construction of cars and tractors could be detected by a magnetic sensor. Smart Dew droplets could also be programmed to detect temperature changes, carbon monoxide emissions, vibrations or light. Each droplet sends a radio signal to a “base station” that collects and analyzes the data. Like the signals sent out by cordless phones, RF is a safe, low-power solution, making Prof. Shapira’s technology extremely cost-effective compared to other concepts. WASHINGTON, March 17—The world’s largest international conference on optical communications begins next week and continues from March 22-26 at the San Diego Convention Center in San Diego. The Optical Fiber Communication Conference and Exposition/National Fiber Optic Engineers Conference (OFC/NFOEC) is the premier meeting where experts from industry and academia intersect and share their results, experiences, and insights on the future of electronic and wireless communication and the optical technologies that will enable it. MARKET WATCH, a three-day series of presentations and panel discussions featuring esteemed guest speakers from the industrial, research, and investment communities on the applications and business of optical communications. See: http://www.ofcnfoec.org/conference_program/Market_Watch.aspx. PLENARY PRESENTATIONS: “The Changing Landscape in Optical Communications,” Philippe Morin, president, Metro Ethernet Networks; “Getting the Network the World Needs,” Lawrence Lessig, professor, Stanford Law School; “The Growth of Fiber Networks in India,” Shri Kuldeep Goyal, chairman and managing director, Bharat Sanchar Nigam Ltd. To access speaker bios and talk abstracts, see: http://www.ofcnfoec.org/conference_program/Plenary.aspx. The OFC/NFOEC Web site is http://www.ofcnfoec.org. Also on the site is information on the trade show and exposition, where the latest in optical technology from more than 550 of the industry’s key companies will be on display. I’ve already bloggedon this nanotech breakthrough from Rice University before, and here’s the latest news straight from the source. Researchers at Rice University have created a metamaterial that could light the way toward high-powered optics, ultra-efficient solar cells and even cloaking devices. Naomi Halas, an award-winning pioneer in nanophotonics, and graduate student Nikolay Mirin created a material that collects light from any direction and emits it in a single direction. The material uses very tiny, cup-shaped particles called nanocups. In a paper in the February issue of the journal Nano Letters, co-authors Halas and Mirin explain how they isolated nanocups to create light-bending nanoparticles. In earlier research, Mirin had been trying to make a thin gold film with nano-sized holes when it occurred to him the knocked-out bits were worth investigating. Previous work on gold nanocups gave researchers a sense of their properties, but until Mirin’s revelation, nobody had found a way to lock ensembles of isolated nanocups to preserve their matching orientation. Mirin’s solution involved thin layers of gold deposited from various angles onto polystyrene or latex nanoparticles that had been distributed randomly on a glass substrate. The cups that formed around the particles – and the dielectric particles themselves – were locked into an elastomer and lifted off of the substrate. “You end up with this transparent thing with structures all oriented the same way,” he said. In other words, he had a metamaterial, a substance that gets its properties from its structure and not its composition. Halas and Mirin found their new material particularly adept at capturing light from any direction and focusing it in a single direction. Redirecting scattered light means none of it bounces off the metamaterial back into the eye of an observer. That essentially makes the material invisible. “Ideally, one should see exactly what is behind an object,” said Mirin. Halas said the embedded nanocups are the first true three-dimensional nanoantennas, and their light-bending properties are made possible by plasmons. Electrons inside plasmonic nanoparticles resonate with input from an outside electromagnetic source in the same way a drop of water will make ripples in a pool. The particles act the same way radio antennas do, with the ability to absorb and emit electromagnetic waves that, in this case, includes visible wavelengths. Because nanocup ensembles can focus light in a specific direction no matter where the incident light is coming, they make pretty good candidates for, say, thermal solar power. A solar panel that doesn’t have to track the sun yet focuses light into a beam that’s always on target would save a lot of money on machinery. Halas said the thinner a cell gets, the more transparent it becomes. “So ways in which you can divert light into the active region of the device can be very useful. That’s a direction that needs to be pursued,” she said. Using nanocup metamaterial to transmit optical signals between computer chips has potential, she said, and enhanced spectroscopy and superlenses are also viable possibilities. “We’d like to implement these into some sort of useful device,” said Halas of her team’s next steps. “We would also like to make several variations. We’re looking at the fundamental aspects of the geometry, how we can manipulate it, and how we can control it better. The paper can be found at http://pubs.acs.org/doi/abs/10.1021/nl900208z?prevSearch=mirin&searchHistoryKey. Haven’t blogged on this subject in a while. It’s always fun to cover, though. IMAGE: Pictured is the new cloak with bump, left, and the prototype, right. DURHAM, N.C. – A device that can bestow invisibility to an object by “cloaking” it from visual light is closer to reality. After being the first to demonstrate the feasibility of such a device by constructing a prototype in 2006, a team of Duke University engineers has produced a new type of cloaking device, which is significantly more sophisticated at cloaking in a broad range of frequencies. The latest advance was made possible by the development of a new series of complex mathematical commands, known as algorithms, to guide the design and fabrication of exotic composite materials known as metamaterials. These materials can be engineered to have properties not easily found in natural materials, and can be used to form a variety of “cloaking” structures. These structures can guide electromagnetic waves around an object, only to have them emerge on the other side as if they had passed through an empty volume of space. IMAGE: This is David R. Smith with the new cloak device. The results of the latest Duke experiments were published Jan. 16 in the journal Science. First authors of the paper were Duke’s Ruopeng Liu, who developed the algorithm, and Chunlin Li. David R. Smith, William Bevan Professor of electrical and computer engineering at Duke, is the senior member of the research team. Once the algorithm was developed, the latest cloaking device was completed from conception to fabrication in nine days, compared to the four months required to create the original, and more rudimentary, device. This powerful new algorithm will make it possible to custom-design unique metamaterials with specific cloaking characteristics, the researchers said. Cloaking devices bend electromagnetic waves, such as light, in such a way that it appears as if the cloaked object is not there. In the latest laboratory experiments, a beam of microwaves aimed through the cloaking device at a “bump” on a flat mirror surface bounced off the surface at the same angle as if the bump were not present. Additionally, the device prevented the formation of scattered beams that would normally be expected from such a perturbation. With appropriately fine-tuned metamaterials, electromagnetic radiation at frequencies ranging from visible light to radio could be redirected at will for virtually any application, Smith said. This approach could also lead to the development of metamaterials that focus light to provide more powerful lenses. The newest cloak, which measures 20 inches by 4 inches and less than an inch high, is actually made up of more than 10,000 individual pieces arranged in parallel rows. Of those pieces, more than 6,000 are unique. Each piece is made of the same fiberglass material used in circuit boards and etched with copper. The research was supported by Raytheon Missile Systems, the Air Force Office of Scientific Research, InnovateHan Technology, the National Science Foundation of China, the National Basic Research Program of China, and National Science Foundation of Jiangsu Province, China. Others members of the research team were Duke’s Jack Mock, as well as Jessie Y. Chin and Tie Jun Cui from Southeast University, Nanjing, China. The field, which applies mathematical principles similar to those in Einstein’s theory of general relativity, will be described in an article to be published Friday (Oct. 17) in the journal Science. The article will appear in the magazine’s Perspectives section and was written by Vladimir Shalaev, Purdue’s Robert and Anne Burnett Professor of Electrical and Computer Engineering. The list of possible breakthroughs includes a cloak of invisibility; computers and consumer electronics that use light instead of electronic signals to process information; a “planar hyperlens” that could make optical microscopes 10 times more powerful and able to see objects as small as DNA; advanced sensors; and more efficient solar collectors. The University of California at Berkeley is doing some interesting work in nanotechnology (such as this “cloak of invisibility”) Applied Materials, the Santa Clara-based nanotech company is making that progress easier to achieve to the tune of more than $5 million. SANTA CLARA, Calif.–(BUSINESS WIRE)–Applied Materials (Nasdaq:AMAT) is advancing semiconductor research with an equipment and service donation to the University of California, Berkeley’s Nanofabrication Laboratory in the Center for Information Technology Research in the Interest of Society (CITRIS). CITRIS is a center of excellence for graduate students, faculty and industrial researchers to create nanotechnology solutions for many of the world’s most pressing social, environmental and health care issues. Applied Materials’ gift consists of processing equipment and a service contract valued in excess of $5 million. The systems complement Applied Materials equipment that was donated to the university in 2002. CITRIS will foster work on novel semiconductor devices and their integration with nanowires/nanotubes, microelectomechanical systems (MEMS), optoelectronics, and bioelectronics. The systems donated by Applied will be used to deposit two of the most critical thin films that are part of next-generation integrated circuits: epitaxy and gate dielectrics. In addition, as a result of Applied Materials’investment and continued support, UC Berkeley will dedicate a collaborative laboratory within CITRIS, known as a “Collaboratory,”to Applied Materials and it will be devoted to energy research. The Collaboratory is a key feature of CITRIS, providing faculty, students and industrial researchers with spaces for project-driven collaboration. The capability of The Collaboratory combines well with Applied Materials’ solar strategy to bring significant change to the industry by developing new technologies that enable lower cost-per-watt solutions for solar cell manufacturing — with the goal of making solar power a significant alternative source of global energy. Applied Materials Inc. (Nasdaq:AMAT) is the global leader in Nanomanufacturing Technology™solutions with a broad portfolio of innovative equipment, service and software products for the fabrication of semiconductor chips, flat panel displays, solar photovoltaic cells, flexible electronics and energy efficient glass. At Applied Materials, we apply nanomanufacturing technology to improve the way people live. A researcher at the University of California at Berkeley claims to have made a 3D metamaterial with a negative refractive index, the first 3D material of this kind. Physicists have in recent years made it possible to bend, or refract, light in the opposite direction to any natural materials. These metamaterials make it possible to create invisibility cloaks that hide an object by steering light around it. The materials and “invisibility cloaks” built so far have all been flat, working only in two dimensions. The negative refraction index will have to be confirmed by measuring the speed of light in the material.